The Intelligent Guerilla Beehive is a sensing device which mirrors the pullution of the environment. Through colonies of ‘color-changing’ bacteria –living on the skin of the hive- it sends out warnings. At the same time it is a device which monitors the bees’ wellbeing. It is a radically new beehive designed for urban environments. 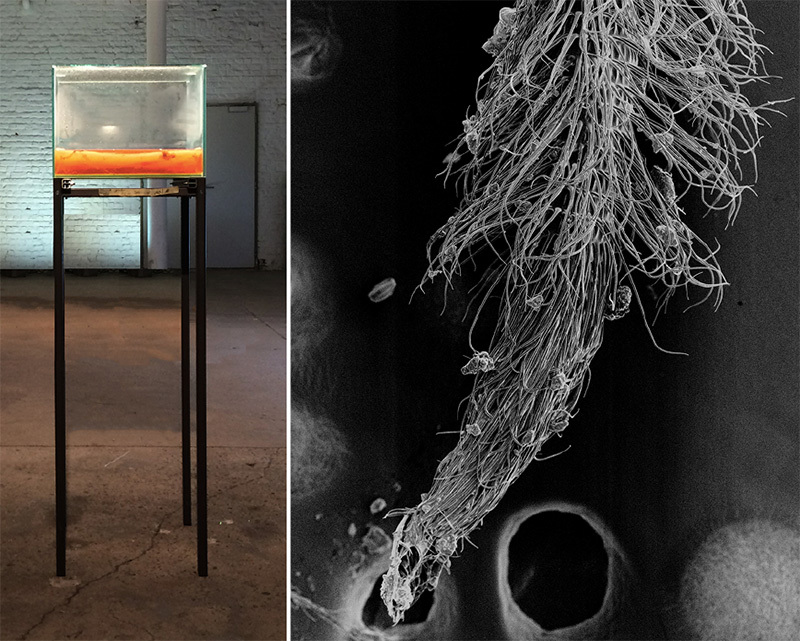 The Intelligent Guerilla Beehive offers a concrete starting point for an exploration of possible futures through artistic research on material science and biotechnology. Navigating between a blueprint and a proof of concept, the Intelligent Guerilla Beehive can be seen as an artifact from the future, a fragment of a world to come. I use this tangible design to tell a compelling story; and through the installation, constructed with various elements of my experiments, I create an immersive experiential future. The Intelligent Guerilla Beehive, front and back. Cellulose Skin with Lactobacillus bacteria. We urgently need to make our lifestyles less destructive for the environment and develop new biotechnological applications that help us to keep our world sustainable in the long run. This project sets steps on a roadmap to achieve these goals. It tackles a new challenging application domain where a collaboration between human and non-human actors is necessary to keep up the resilience of the system. Driven and inspired by the intelligence, complexity and self-organisation of the Super Organism -the bee swarm- I research smart organic materials and I develop biomimetic habitats augmented with living technology. The Sensorial (microbial) Skin is such a smart fabric that integrates a mix of organic and electronic elements for sensing and actuating, for computation and for communication. Palynology offers a good starting point for my research. It is the study of pollen grains and other spores. The determination of the pollen which are brought by the bees to the hive can help us to map the foraging areas of the bees. Pollen give us useful information on the environment, for a wide range of purposes. On top of this, pollen shapes are of an extreme aesthetic beauty. They turned out to be a huge source of inspiration for the formal design of my Intelligent Beehive. 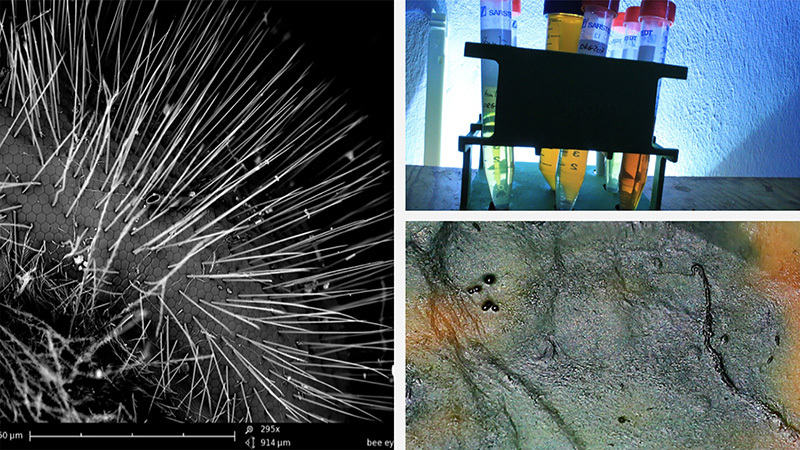 In August 2013, I started to work with the Scanning Electron Microscope (SEM) at the Vrije Universiteit Brussels (VUB). 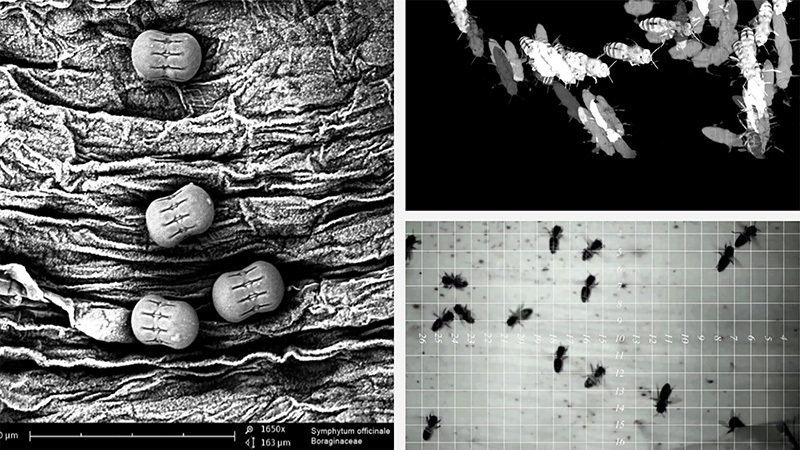 The SEM offers the possibility to make perfect 3D images up to +20.000 enlargment scale. Ideal for studying and photographing small particles as pollen grains, pollution particles and bee-parts as proboscis, receptors on the antennae, e.g. 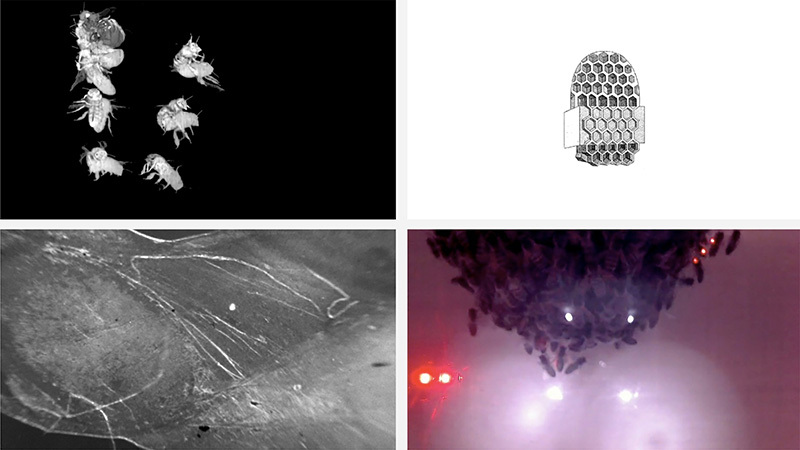 Dancing bees – observation inside the beehive (still image from infrared observation video). Red Flag – alert for the status of the environment. Cellulose fabric grown by Acetobacter bacteria and colored with Hibiscus flowers. After several years of non-intrusive honeybee observation with customized devices powered by green energy (see Transparent Beehive, Sound Beehive), I start my Laboratory for Form and Matter. This Alchemical laboratory focuses on biotechnology. I create small objects to experiment with the behaviour of matter, to explore material structures and to research emerging artistic phenomena. I experiment with micro-organisms and organic materials to create thin membranes and surfaces grown by a symbiotic community of bacteries and yeast cells. 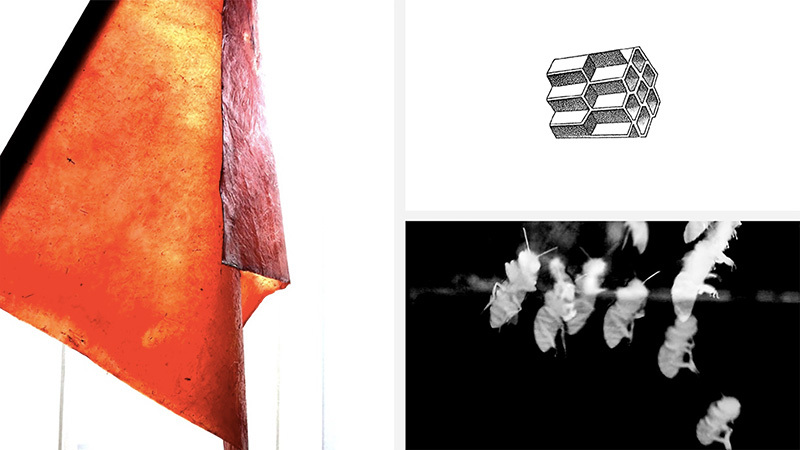 In a second phase, this leather-like cellulose skin will be augmented with living technology. I experiment with biofilms, filled with useful microbes for environmental sensing as well as with biofilms with antibiotical properties (to support the bees against the Varroa destructor parasite). 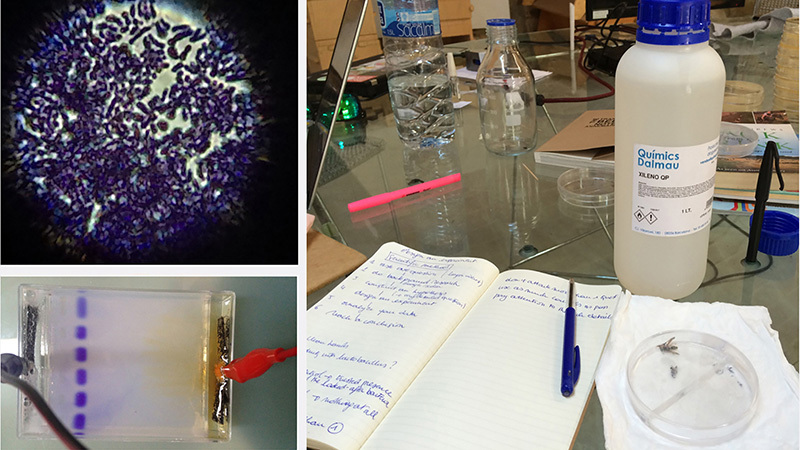 In the biohacklab we engineer cells into biosensors, and we implement them on the leathery cellulose skin to sense environmental pollution. 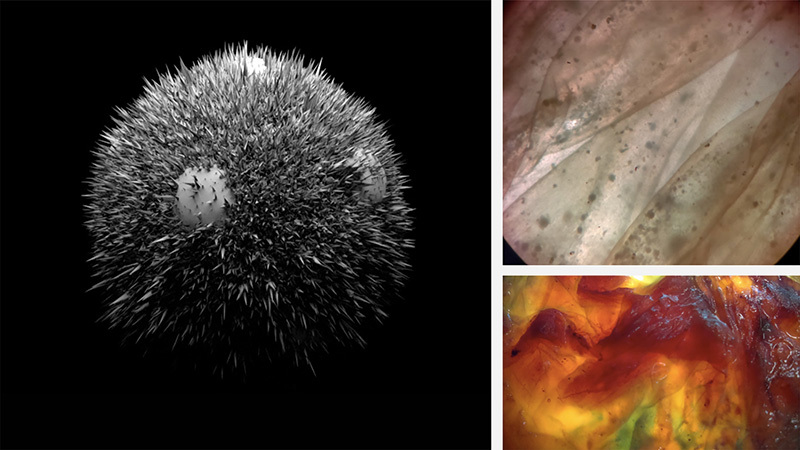 We work with ‘bacterial skins’ as programmable material. Specific bacteria act as biosensors, they change color when they sense a specific pollutant (air, pesticides). 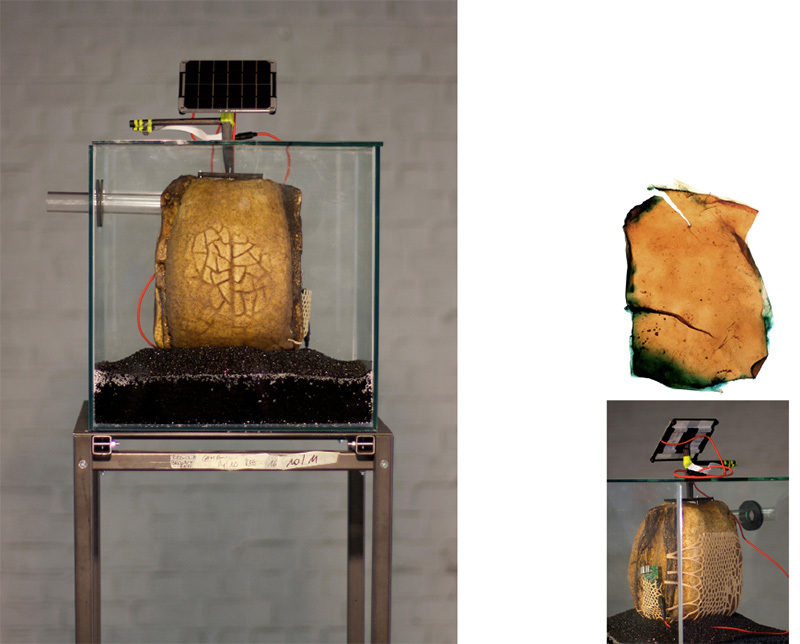 The double-layered skin of the Intelligent Beehive behaves as a bio-digital living system, the living matter itself (the bacteria) becomes the monitoring technology. 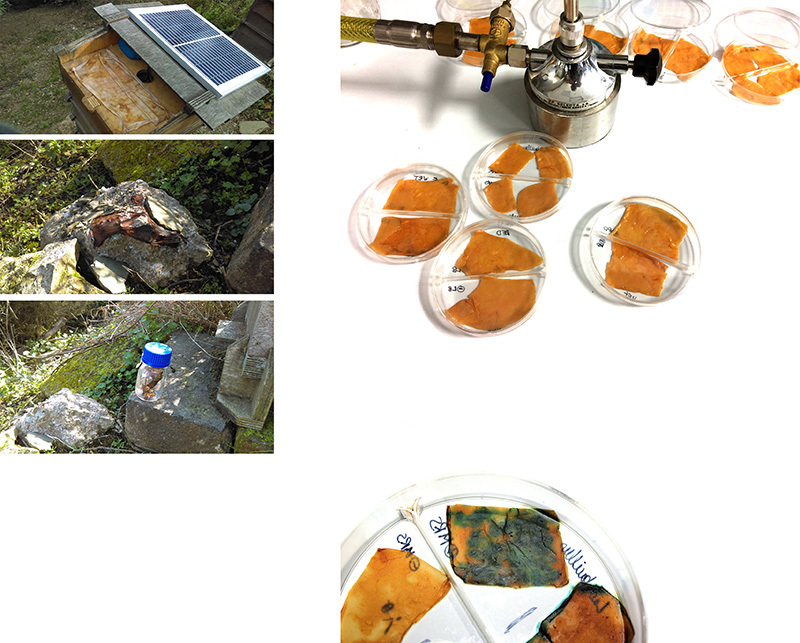 Parallel to these experiments, we investigate the possibilities of adding chitine/chitosan on top of the microbial skins, to enhance the skins’ qualities of resistance, waterproofness and strength. Wet cellulose skin with Lactobacillus plantarum bacteria (macro). Pollen grains of Symphytum officinale, SEM microscopy x 1650. In search of micro-organisms to experiment with, we went hunting for bacteria in the forest of Collserola close to Barcelona. We left some wet cellulose skins in a beehive for a few days. Once collected, the (possible) bacteria on these skins were put to growth with LB medium in a steriale container, and later strikes were brought to culture in petridishes. Several strains of bacteria were recovered from those samples, but most of them had no color and thus were not usefull for our experiment. Conclusion: after a few of experiments with bacteria, to make them grow in a biofilm on cellulose skin, only the Lactobacillus plantarum was able to survive on the skin. 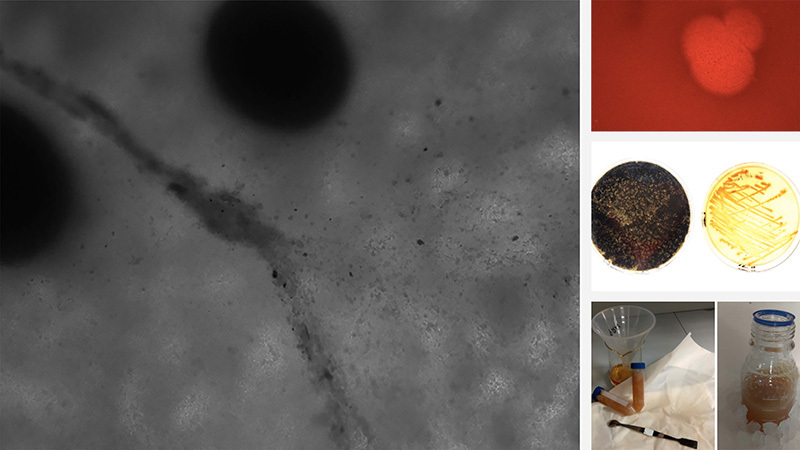 The microscopic images have demonstrated that. Luckily the Lactobacillus not only grows, but also changes its colour when a modifier tresshold (pollution, pesticides, X-gal for the tests) is passed. Bacteria cultures (Lactobacillus plantarum and Deinoccoccus radiophilus) in the lab. On this micrograph of a honeybee eye (X 295), rendered by the Scanning Electron Microscope, we see that a bee’s eye is composed of thousands of hexagon pixel lenses, with a form identical to the cells in the honeycomb, and that there are a lot of hairs to protect these lenses. In between the hairs we can spot pollen and dust particles. The bees’ antennae -their instrument to scan the environment on all sensitory levels- are full of receptors. With these receptors, the bees sense an smell. The hairs on the bees’ body are electrostatic and thus they transport pollution particles from the environment to the beehive. Apis mellifera eye. 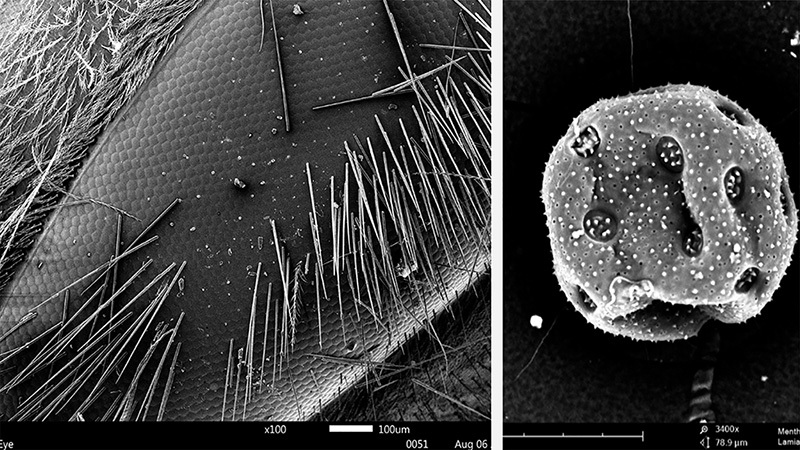 SEM micrography, x295. A selection of beneficial bacteria in test tubes. Close up on a piece of microbial grown skin, stained by Lactobacillus plantarum bacteria. When the bees land upon the outer skin of the beehive, these pollution particles come in contact with the bacteria living in the biofilm layer which is envelopping the outer shell of the Intelligent Beehive grown out of microbial cellulose. Our experiments proved that the microbial cellulose is a good growth medium for the bacterial colonies. The outside of the shell is the home for bacteria that sense the environmental threats – they change color under specific circumstances. The inside of the shell hosts bacterial colonies which are reflecting the healthy microbiome of the bees by their development; these bacteria give the bees a ‘good feeling’ in their nest, a kind of ‘wellness’, and make them at once more resistant to natural ennemies as varroa mites or other bee-pathologies. With the ongoing development of the bacterial colonies, the cellulose skin acts as a crust that crumbles under the ever new layers of bacteria. So the Intelligent Beehive’s outer skin is protected by a layer of living cells that constantly feed off the dead ones and thus cleans and repairs itself. Preparing nanofiber microbial skin (crystal cellulose). 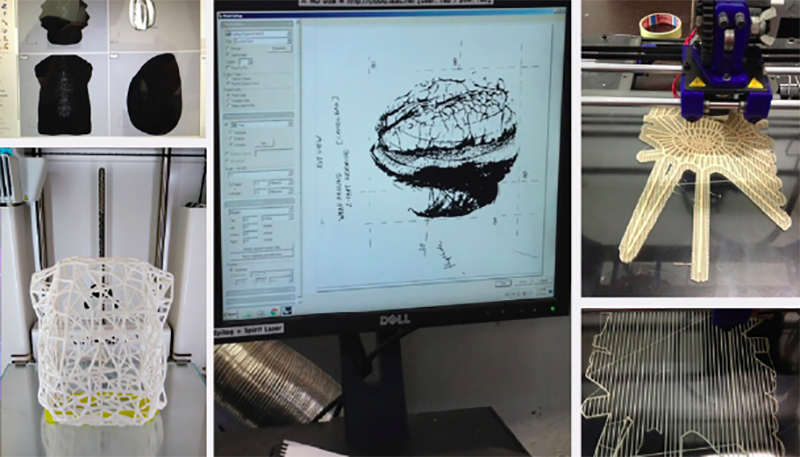 One of the initial goals of the project was to research the possibility to 3D print the skeleton of the beehive with chitosan, a component that can be found in the exoskeletons of invertebrates. 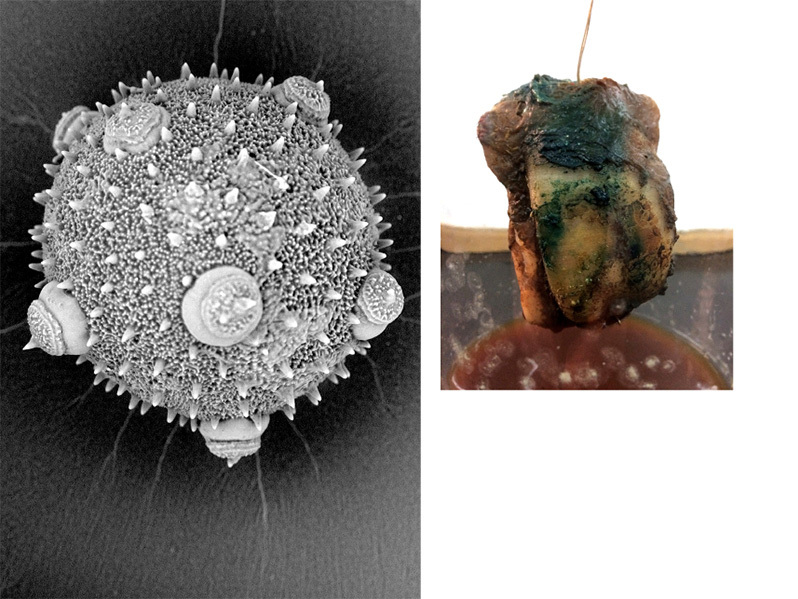 This skeleton would then be wrapped with a microbial skin and topped with a biofilm populated by bacteria. We did a lot of lab-experiments and made some casts with different concentrations of chitosan, to finally conclude that realizing an acceptable quality of 3D print with this material still needs a lot more testing and an the customizing of a dedicated 3D printer. This is a research project an-sich! Thus we decided to rather focus on the experiments with colorchanging bacteria to come to a ‘proof of concept’ for our Intelligent Guerilla Beehive hypothesis. Customized 3D printed to print with agar. All ingredients to make chitosan as a basic material for adding to microbial skin. Pieces of microbial skin in petridishes, ready for chitosan experiments. Test piece of Chitosan 12% concentration, after drying. Thus we focused on growing microbial skins, and how to make the skins strong and waterresistant and how we could augment the skins with bacterial biofilms in order to turn them into living monitoring technology. One of the experiments we carried out was making microbial skin grow immediately around an object: a small 3D printed model of the beehive. 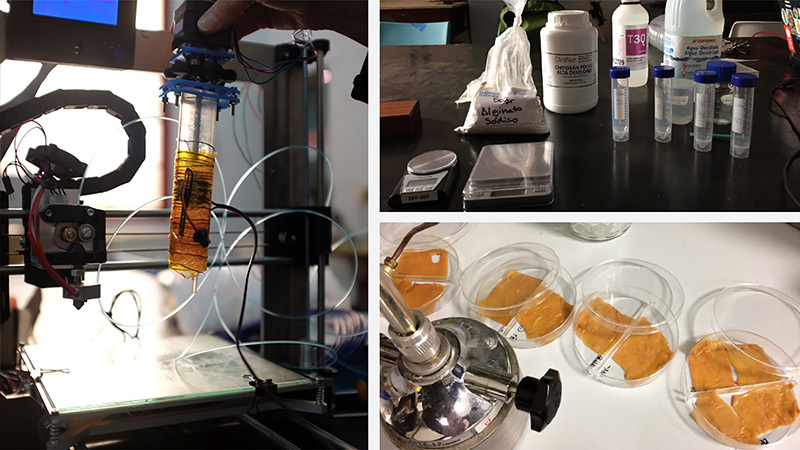 Therefore we constructed several test setups with magnetic stirrers, lego-constructions and stepper motors to assure a steady turnover of the object in the growth medium. After some failures our patience was awarded. In a room temperature of 25°C and after 2 weeks of rotations, a skin started to grow around our object: the 3D printed beehive model, filled with wooddust and drenched in growthmedium (cellulose starter pulp, green tea and sugar). The result was hung to dry in a sterile jar that serves as an DIY bioreactor. There the freshly grown skin was inoculated with Lactobacillus plantarum bacteria and X-gal, a modifier which is used in molecular biology to test for the presence of an enzyme. 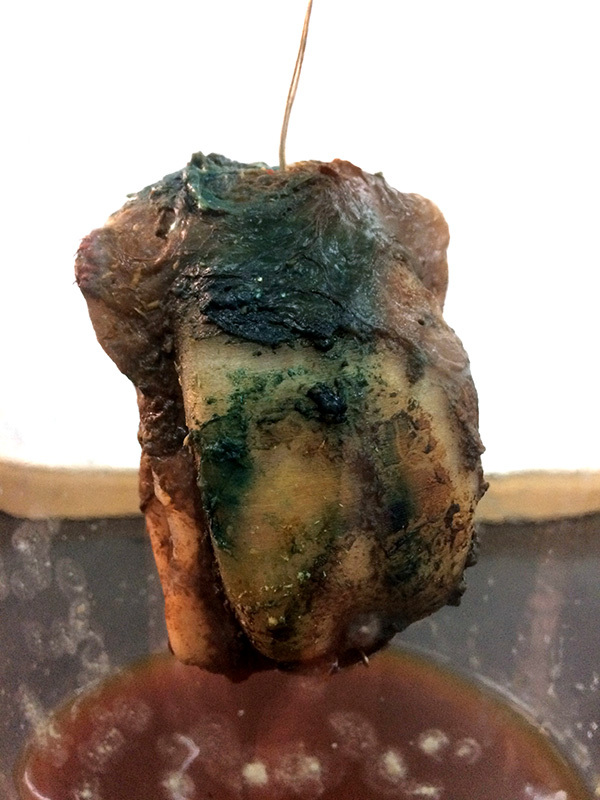 The activity of this enzyme yields a greenish-blue color, which is clearly visible on the skin of our little beehive model. Cucurbita pepo pollen grain, SEM micrograph x 1150. PLA printed beehive-model with skin grown around it in a rotation experiment. Grow your own Beehive, Biology Zero, Sculpting with Skin, Learning from Nature, Speculative Stories, Material Experiments, Guerilla Beehive project page, … and many more online pages keep track of the development of the research project ‘Intelligent Guerilla Beehive’. DNA-testing during the Bio Zero course. On this project I was working in close collaboration with the scientist Núria Conde Pueyo and the digital designers Anastasia Pistofidou and Joeri Bultheel. Núria holds a PhD in biology and computer science and is the co-founder of the Bio Hacklab Barcelona. Joeri Bultheel is an idependent electronic music composer and app developer, with a masters degree in computer science. 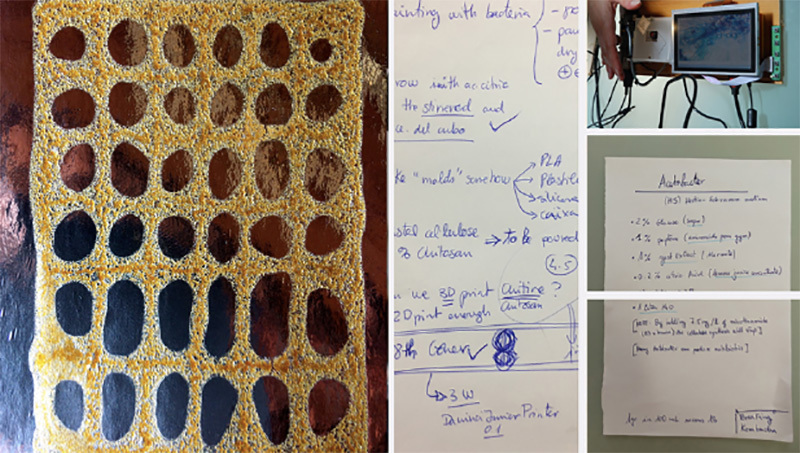 Anastasia Pistofidou is specialised in digital fabrication technologies and design, with a master degree from the Institute for Advanced Architecture of Catalonia (IAAC), where she currently works as founder and coordinator of the Fab Textiles group. 3D modelling of the hive. 3D print of the skeleton of the beehive. Analysis of bee activity inside the beehive. Precursors to the Intelligent Guerilla Beehive project were the Transparent Beehive project and the Soundbeehive project. Both of these projects were carried out in my rooftop Bee Laboratory and were outlined to study the development of a honeybee colony through its own sound. The buzz of a colony and its behaviour and conditions are quite related. It is possible to know if a hive is queenless or if an important amount of nectar has been collected simply by listening to it. For this experiment I followed a systemic approach to raise understanding of the characteristics of the colony through relationships with its environment, through patterns discovered in the collected audio, video and sensor data, and through contextual observations. I studied the bees as a re-generating network of actors (autopoiesis), all of them contributing to the organisation and well functioning of the colony, the super organism. Customized open source hardware and software was developed in order to continually monitor the sounds on different spots in the beehive. I uploaded the annotated video and audio data for public viewing in the opensource videodatabase pandora. All corresponding sensor data are publicly available on opensensordata.net. The information archive was growing as more audiovisual observations and more sensor data were added over time. All of these were recorded in the broodnest of the soundbeehive installed on the roof top of my Brussels Urban Bee Laboratory. The data were processed using sophisticated pattern recognition, AI technologies, and sonification and computer graphics software. The project included an experiment in using Deep Learning to interpret the activities in the hive based on sound and microclimate recording. A video shows 365 days of activity inside a real observation beehive, played back at higher speed. The images were recorded with an infrared camera inside the hive and processed using pattern recognition, AI and computer graphics algorithms. 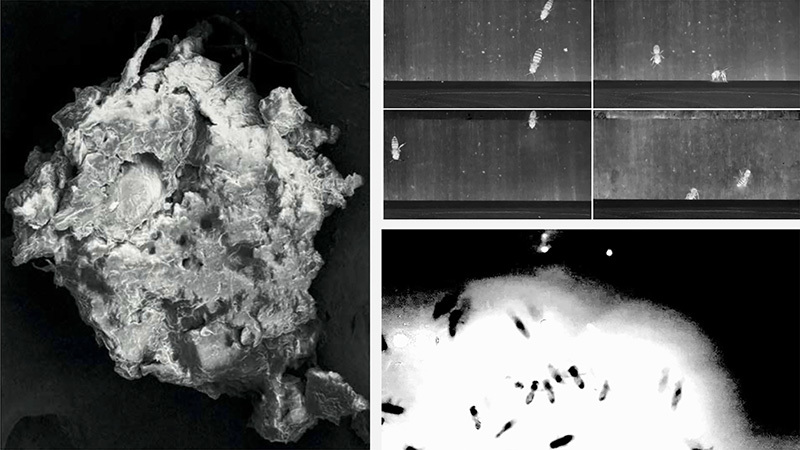 These images give a stunning visual experience of a colony in action. 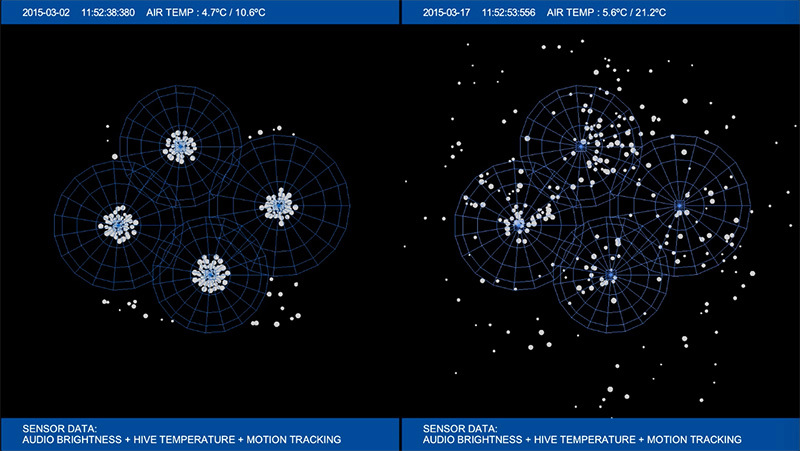 A second video shows a graphical rendering of AI analysis of colony behavior combining real audio data with measurements of microclimate inside the hive: temperature, CO2 and humidity and using Deep Learning to detect patterns in the data. The data were transformed into a multi-dimensional feature space, and presented to a Deep Learning network to extract categories capturing patterns of activity through unsupervised learning. An original visualisation was developed which represents categories as attractors in a projected 3d space, with the size of the attractor reflecting the strength of the category.